Electronic speedometer (only systems with SERVOTRONIC). Electronic control unit (only systems with SERVOTRONIC). Electro-hydraulic converter (only systems with SERVOTRONIC). 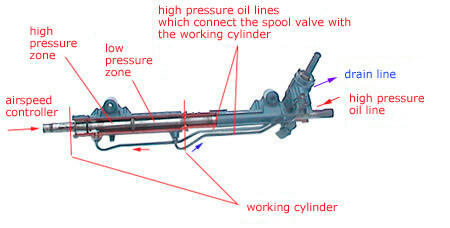 Steering unit, equipped with a hydraulic cylinder. So how does it work? Let’s take the rack-and-pinion steering system for example. Hydraulic fluid flows from its reservoir (6) to the hydraulic steering pump (5) where it is compressed. The liquid travels under pressure through the high pressure oil line (8) (hose or pipe) and enters the steering unit (4) under the pressure of 70-180 bar depending on the car model. The spool valve unit combines the high pressure oil line and drain line. The fluid passively travels from the high pressure oil line to the oil reservoir (6). You turn the steering wheel and the oil lines in the spool valve switch correspondingly. The valve allows the fluid to the working cylinder, which creates power assistance (Hydraulic press principle). At this moment the piston’s back cavity joins with the low-pressure oil line, through which the fluid travels back to the reservoir. As soon as no effort is applied to the steering wheel the system returns to its neutral state (see point 1).